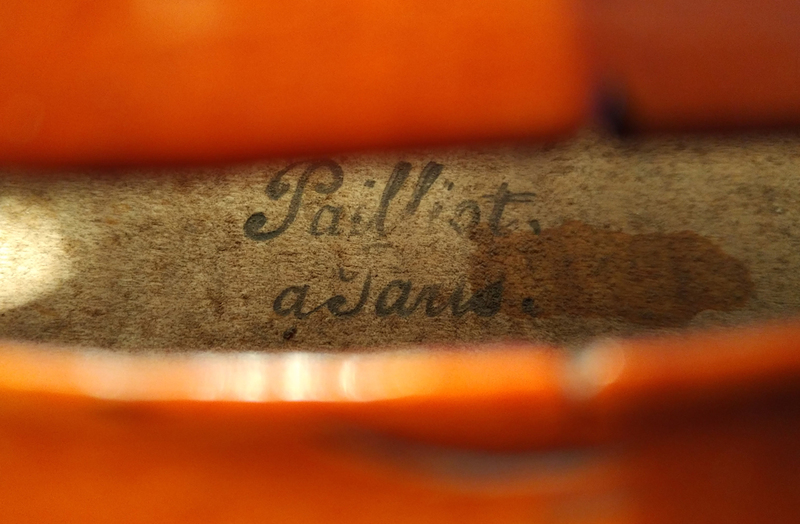 This beautiful antqiue French violin by the brothers Pailliot is an unmistakable early 19th century quality instrument from Mirecourt, that was built around 1820. The signature inside indicates a work by "Pailliot". This violin is preserved crackfree and features an outstanding sound that is worthy of its claimed provenance, with a clear, radiant, bright and sweet voice that is balanced throughout all of the violin's registers, with assertiveness and a broad scope. Its very transparent, orange brown varnish with an older lustre and patina gives this premium instrument its elegant aesthetic, which is complemented by an expressive, individually styled scroll - which is probably a later work. We offer this interesting French Pailliot violin in best condition, ready to play and worked over by our experienced luthier. Order a certificate of appraisal with this violin, the certificate option is available in the shopping cart.